Home > Scriptures > Is Apostle John Beloved Disciple of Jesus Alive even Today? Is Apostle John Beloved Disciple of Jesus Alive even Today? If we read all the four gospels we would come across two different John's. One is John the Baptist and the other one Apostle John(Disciple whom Jesus loved). John the baptist is relative of Jesus who came to make a way for Jesus ministry. Later he was beheaded on the orders of Herod. But in this post I want to focus on the disciple whom Jesus loved the most. He is none but Apostle John who has been referred to as a disciple who always used to stay close to Jesus heart. He is also a relative for Jesus Christ. Only disciple who is not killed by Martyrdom. He was once thrown into hot oil but he did not die. James and John were the cousins of Jesus and their mother Salome was the younger sister of Mary, the mother of Jesus. What is so special of John the Apostle? Some things we need to note or consider before going on in this topic is about the style and the words used by John in his Gospel and his epistles. He is the only Apostle who stresses more on Life and Love. Just read the three epistles of John you would notice that John uses words like Love and Life. Now I want to stress more on Life. Lets see some of the scriptures which are taken from Gospel of John. I have highlighted the word's life or live in bold just for the sake of identification. So what is common in the above scriptures? all scriptures says about life and about living for ever. If you were a regular Sunday school goer you might have come across John 3:16 which also conveys the same message. See this Video from Gospel of John Movie which I have collected. Do you know the below Scripture? What is Jesus trying to say in the above scripture is he referring to Apostle John? 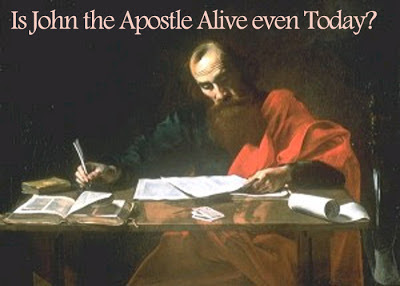 Is Apostle John Alive today? I do not agree with above post. John is talking about eternal life ( in heaven). and those are words of Jesus. not John's own thoughts. Well then if Jesus was talking about eternal life which is in heaven then Jesus should not have mentioned about how Peter is going to die on earth. I never said those words are John's thoughts. I meant John was the only disciple who was able to pick the word "eternal life" among all the other disciples. yes, he is soon to resume his ministry and declare the book he ate in Revelation to all people as many shall hear and be saved. His return will coincide with the great earthquake in Revelation 6 which begins the day of the Lord.